This "Historically Speaking" column was published in the Exeter News-Letter on Friday, December 8, 2017. In early December of 1917, Exeter’s residents were readying themselves for Christmas under war restrictions. There hadn’t been many changes – just a few limits on sugar – but concerns about fuel during the upcoming winter weighed heavily on people’s minds. Still, the holiday spirit had taken hold. The shops were advertising gifts even though the general mood was one of economizing and practicality. Clothing sales were still strong, as were useful gifts such as umbrellas, stationary and handkerchiefs. The Red Cross was working hard to enroll members and raise funds for their efforts in the war. Most people did their marketing on Thursday – an old tradition that still held sway in town. On Thursday, December 6th, news began to trickle into town that something catastrophic had happened in Halifax, Nova Scotia. Sketchy details at first of a possible explosion in the harbor came in over the telegraph. News didn’t travel as quickly one hundred years ago. 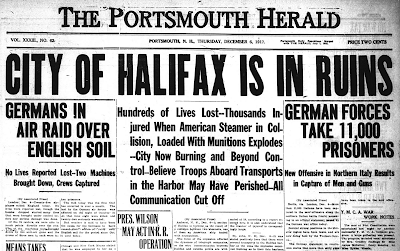 By afternoon, when the Portsmouth Herald was delivered to town, it was confirmed: the city of Halifax had been mostly destroyed by an explosion from a munitions ship in the harbor. 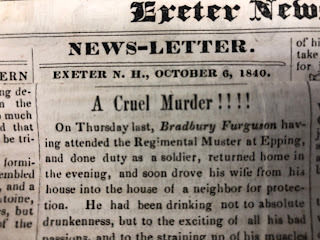 The Exeter News-Letter, which published only once a week, had already gone to press on the sixth and missed the story until the following week. The explosion, later determined to be the largest man-made explosion until the atomic blast at Hiroshima, had sent shock waves that destroyed the dynamos of telegraph communications surrounding Halifax. And if thousands of dead and wounded buried beneath rubble weren’t bad enough, it began to snow. Nova Scotia found itself in the midst of one of the worst blizzards in decades. On the morning of December 6th, an empty Norwegian ship, the S.S. Imo, was eager to leave Halifax harbor to get to New York, where it was due to pick up relief supplies for Belgium. Meanwhile, the French munition ship, S.S. Mont-Blanc, needed to enter the harbor to register before crossing to France with a cargo hold full of high explosives. Both vessels signaled the other that they weren’t yielding the channel and only fully realized the danger when it was too late. Although it was a low-speed crash, the Mont-Blanc quickly caught aflame. Realizing the danger, the captain told the crew to abandon ship. In the city, residents eagerly turned out to watch the fire. At 9:04am, the Mont-Blanc exploded, immediately killing an estimated 1600 people. The shock wave that followed shattered every window in the city. Of the multiple types of injuries suffered by the population, eye injuries from broken glass were the most common. Houses shook and those that weren’t immediately damaged by flying debris quickly caught on fire by overturned stoves and lamps. The shock wave was followed by a tsunami that flooded the shoreline and destroyed a local First Nation community of Mi’kmaq. Survivors tried to rescue their fellow citizens. A quick thinking telegraph operator managed to get one message out before the explosion telling trains not to approach the city. The operator was killed, but the passengers on the train survived and used tools from the railroad to help rescue the injured. By noon, the Halifax city council had begun to plan how to manage the disaster. By the next morning, a blizzard had arrived. Those still trapped under debris began to freeze to death. The final death toll may never be precise, but current estimates hold that roughly 2000 people perished. Exeter’s residents pitched in as best they could. “Subscriptions for the relief of Halifax will be received at the drug stores, James H. Batchelder’s, A.E. McReel’s, by the Gas Light Company, and the Exeter and Hampton Electric Light Company.” It took only a week for the town to collect $315 dollars – no small sum in 1917. 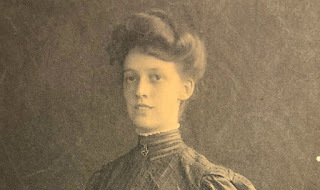 By December 11th, the Herald was reporting, “Sufficient Medical Aid at Halifax – additional supplies should be sent only by request.” In Halifax, the grim task of identifying the dead had begun using the same careful system created in 1912 to identify the victims of Titanic. Relief trains continued to roll through town for months. To this day, Halifax annually supplies the City of Boston with a Christmas tree in thanks for their efforts in the relief of the city. 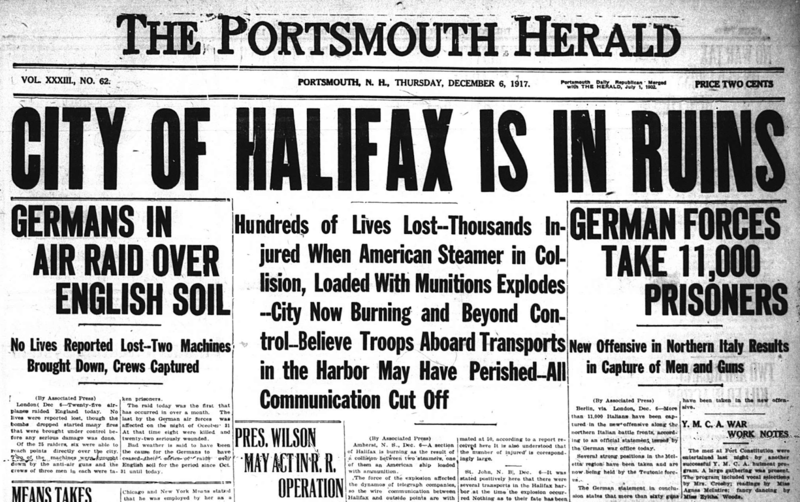 Image: the front page of the Portsmouth Herald, December 6, 1917.